Mary Ann joined City, University of London in 2006 as Programme Director of the MA in Publishing, and launched the MA in International Publishing in 2011 and the MA Creative Writing and Publishing in 2014. She is a former Director of Methuen & Co Ltd, and was a Deputy Publisher at Routledge well as an e-learning consultant and developer. Before joining City, she taught at Kingston University, the University of Surrey, the Open University and Middlesex University. Under Mary Ann’s leadership, City’s sector-leading Publishing MAs have attracted endorsements from alumni and the industry as well as top ratings from current students. As recognised by both Technology Champion and Enhancing Student Employability awards at City University London, her innovations have contributed to the programmes’ consistent success in supporting City’s publishing graduates to achieve their career ambitions. In 2016-17, these pedagogical successes informed the launch of City, University of London's innovative BA English, which combines research excellence in teaching with modules and assignments which encourage our students to graduate with a portfolio of achievements to inform and support their career aspirations. Mary Ann was appointed Associate Dean (Student Experience), School of Arts and Social Science in January 2017, with the aim of ensuring that all of the School's programmes reflect sector-leading practice in employability and student satisfaction. Mary Ann was also a founding member of the executive board for the University's Centre for Creativity in Professional Practice, which was launched in 2009 and is part of the Cass Business School. She leads the ‘Creativity and the Creative Industries’ module for the interdisciplinary, innovative Masters in Innovation, Creativity and Leadership. Mary Ann is an active member of the Association of Publishing Education, and represented the Association as a panel member to redefined the National Occupational Standards for Publishing in 2012. She has served as both External Examiner and External Validator for other programmes, and frequently presents at international conferences. She also works as a consultant, both for commercial publishers and as a designer and deliverer of creativity and management initiatives. Her research has two main strands: publishing history, with a special focus on academic publishing and the impact of digitisation; and pedagogical research focused on the role and impact of experiential and arts-based learning in higher education. Mary Ann is an active member of the Association of Publishing Education, and was a member of the panel which in 2012 redefined the National Occupational Standards for Publishing. She also works as a consultant, both for commercial publishers and as a designer and deliverer of creativity and management initiatives. 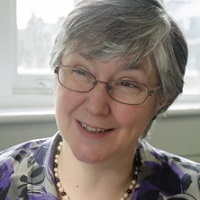 Mary Ann's research interests include the commercial and technological history of publishing's responses to globalisation and digitisation; the pedagogy of publishing programmes for transferable outcomes and employability; the UK industry's employment practices as a creative industry; and management education and development processes which include creative practices drawn from the arts. In 2012-13 she acted as Principal Investigator for Equip (Equality in Publishing), a £70,000 research project sponsored by Arts Council England, which in 2014 moved to the joint management of the Publishers Association and the Independent Publishers Guild. Kernan, M.A. (2013) Routledge as a global publisher: a case study 1980–2010, Publishing Research Quarterly; 29(1): 52–72. Kernan, M.A. (2013) When is a publishing business truly 'global'? An analysis of a Routledge case study with reference to Ohmae's Theory of Globalization, Publishing Research Quarterly; 29(4), 344–64..
Holtham, C, Kernan, MA, Owens, A and Pässilä, A (2013) Accelerating movement across the intentional arc – developing the strategic sensographer, Conference Proceedings, 8th International Conference in Critical Management Studies, University of Manchester (10 July 2013) [Online]. Available: Publications [11 October 2013]. Kernan, M.A. (2017). An exploration of Barnett’s analysis of the ‘ecological’ university (2011) and the potential contribution of arts-based pedagogy and knowledge. In Ward, J. and Linstead, S. (Eds. ), Empowering the Intangible (pp. 73–88). York: University of York, Heslington, York, YO10 5DD. ISBN 978-0-901931-19-1. Kernan, M.A. (2015). Transforming identity through arts-informed, collaborative learning and reflection: case study of a Masters programme in innovation, creativity and leadership. (pp. 2038–2047). Kernan, M.A. (2014). A review of the theoretical foundations of research into arts-based interventions in organisations and management education, and their methodological implications. (pp. 2222–2235). Jones, S., Kernan, M.A.K. and Holtham, C.W. (2017). Taking the MICL: An Interdisciplinary Masters Programme in Innovation, Creativity and Leadership. EFMD Research Conference 23-24 October, Leuven. Holtham, C., Rich, M., Brown, A. and Kernan, M. (2017). Three dimensions of ambiguity: what they mean for management students. Chartered Association of Business Schools’ Learning, Teaching & Student Experience 2017: Showcasing excellence in business and management education 25-26 April, Bristol. Holtham, C., Rich, M., Brown, A. and Kernan, M. (2017). Coping with ambiguity: a key focus in educating 21st century leaders. ”, International Federation of National Teaching Fellows Inagural World Summit, Defining Teaching Excellence within the Disciplines 16-18 February, Birmingham. Kernan, M.A. (2017). Towards applying the work of Iain McGilchrist and Guy Claxton to the analysis of arts-based experiences. Vic, Catalonia, Spain. Kernan, M.A. (2017). Higher education, employability and the Teaching Excellence Framework: City’s BA English and the broader potential of publishing education. Florence, Italy. Kernan, M.A., Rich, M., Brown, A. and Holtham, C. (2017). Educating innovative leaders for the unordered world of VUCA. Knowledge Management in the 21st Century: Resilience, Creativity, Co-Creation St Petersburg, Russia. Kernan, M.A., Rich, M., Brown, A. and Holtham, C. (2017). Three dimensions of ambiguity: what they mean for management students. Bristol. Kernan, M.A. (2017). An exploration of Barnett’s analysis of the ‘ecological’ university (2011) and the potential contribution of arts-based pedagogy and knowledge. 8th AoMO Conference: Art of Management Conference 2016 1 Sep 2016 – 4 Sep 2016, IEDC-Bled School of Management, Slovenia. Kernan, M.A. (2016). Collaboration and aesthetic pedagogy: A theoretical analysis of creative group performances in a Masters programme in Innovation, Creativity and Leadership. Dresden, Germany. Kernan, M.A. (2016). The Second Arden Shakespeare Series: A theoretical discussion and analysis. Florence, Italy. Kernan, M.A. (2015). Exploring Creativity Through Creative Artefacts and Group Performances: Analysis of the students’ accounts of a Masters programme in innovation, creativity and leadership. Off the Lip: Transdisciplinary Approaches to Cognitive Innovation 9-11 September, Plymouth University. Kernan, M.A. (2014). Research into Arts-based Interventions in Organisations and Management Education: Theoretical foundations and methodological implications. IFKAD 2014 – International Forum on Knowledge Asset Dynamics 11-13 June, Matera, Italy. Kernan, M.A. (2014). The Arden Shakespeare, 1890 to 2014: A cultural, historical, commercial and technological case study. By the Book: The book and the study of its digital transformation 23-24 May, Florence, Italy. Holtham, C., Kernan, M.A., Owens, A. and Pässilä, A. (2013). Accelerating movement across the intentional arc – developing the strategic sensographer. 8th International Conference in Critical Management Studies 10-12 July, University of Manchester. Holtham, C., Kernan, M., Owens, A. and Pässilä, A. (2013). Accelerating movement across the intentional arc – developing the strategic sensographer. 8th International Conference in Critical Management Studies 10-13 July, Manchester. Kernan, M.A. (2012). The Pros and Cons of an MA in Publishing. Society of Young Publishers 18 April, London Book Fair. Kernan, M.A. The Pros and Cons of an MA in Publishing. London Book Fair 2012 Earl's Court, London. (2016). The Launch of the First Series of the Arden Shakespeare in 1899: An exploration of Bourdieu’s concept of consecration. Logos, 27(2), pp. 32–47. doi:10.1163/1878-4712-11112103 . Kernan, M.A. (2013). When is a Publishing Business Truly ‘Global’? An Analysis of a Routledge Case Study with Reference to Ohmae’s Theory of Globalization. Publishing Research Quarterly, 29(4), pp. 344–364. Kernan, M.A. (2013). Routledge as a global publisher: A case study, 1980-2010. Publishing Research Quarterly, 29(1), pp. 52–72. doi:10.1007/s12109-013-9304-9 . Kernan, M.A. Digital India: Research Report for HarperCollins Press.. The Pros and Cons of an MA in Publishing. London Book Fair (2012). Your Job in Publishing – Recruitment and Retention in the Digital Age. London Book Fair (2012). Innovation and the printed book. City University London (2011). Employability and Publishing. Stationers’ Hall, London (2011). International Digital Publishing Conference. City University London (2010). Employability in digital publishing after an MA in Publishing. City University London (2010). Learning Forum London 2010. London (2010).